Utah State University researchers Scott Shahverdian, left, and Elijah Portugal unload a USU-built pond leveler at a Logan, Utah Walmart store for a water conservation project. The leveler is designed to prevent beaver dams in the surrounding creek from causing flooding, while leaving the mammals undisturbed and able to continue activities that promote water conservation. Credit: Mary-Ann Muffoletto/Utah State University. As they pull into the parking lot, shoppers preoccupied with the day's errands barely notice the small creek surrounding Logan, Utah's Walmart Supercenter. Yet the waters, shrouded by willows and cattails, teem with beavers, long-time inhabitants partially responsible for the area's name: Cache Valley. In earlier centuries, trappers cached pelts and supplies in the area. The big-toothed rodents were nearly hunted to extinction during the 19th century in the mountain-encircled community, along with other areas of North America. But Utah State University scientists say the furry mammals are emerging as a valuable resource in restoring ecosystems imperiled by land use practices, drought and a changing climate. "Beavers play a critical role in maintaining healthy aquatic and riparian habitat, which we desperately need in arid Utah," says USU researcher Elijah Portugal. "Beaver dams store water in springtime, slow down the release of snowpack and prevent water from moving too quickly and evaporating, which benefits wildlife and all downstream users. Their dams also capture sediment, which improves water quality,"
Unfortunately, the stubborn, little critters can also be a nuisance. "They don't stop," Portugal says. "Their constant dam building can cause damaging flooding." In negotiations with Logan City, Walmart agreed to maintain the wetlands on their property, when the global retailer added the store to the northern Utah town in 2006. What the retailer didn't bargain for was its industrious neighbors' relentless dam-building efforts that threaten flooding of the store's campus and surrounding roads and properties. 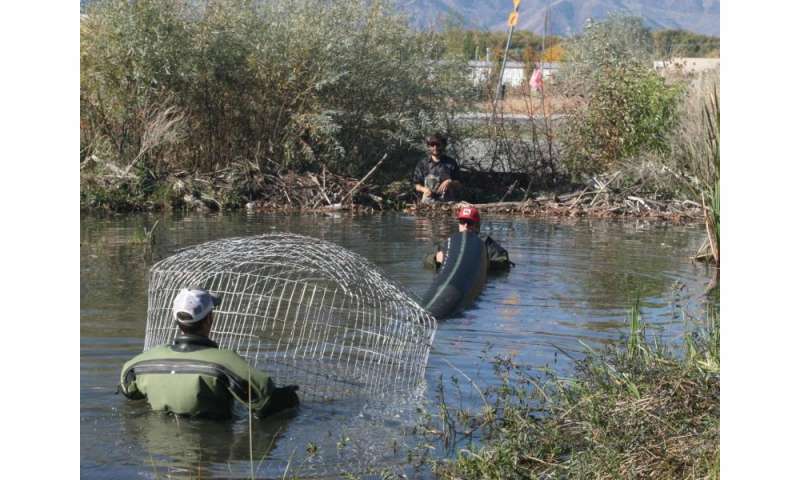 In creek waters surrounding a Logan, Utah Walmart store, Utah State University researchers Elijah Portugal, Nick Bouwes and Scott Shahverdian ease a pond leveler and tube into place on a beaver dam. The leveler will prevent flooding without disturbing the beavers, whose dam-building efforts help to keep the wetlands habitat healthy. Credit: Mary-Ann Muffoletto/Utah State University. After repeated, unsuccessful attempts to move the beavers and their dams from its property, Walmart, prompted by the Bear River Watershed Council, turned to USU's Fluvial Habitats Lab and local consulting group Eco Logical Research, Inc. for assistance. "Beavers are brilliant engineers, providing multiple benefits that are difficult and expensive for humans to accomplish," says Nick Bouwes, adjunct faculty member in USU's Department of Watershed Sciences and owner of Eco Logical Research. "We believe there are ways to co-exist with beavers, while mitigating their harmful habits." To this end, Bouwes, Portugal, their students, Utah Conservation Corps members and community volunteers gathered at the Logan Walmart Oct. 12, 2015, to install two pond levelers, crafted in the USU lab, to the store's surrounding waters. The cage-like levelers, made from wire, are connected to large plastic tubes that allow water to pass, while catching debris, and prevent beavers from building dams to flood-inducing heights. The researchers installed a leveler on each of two beaver dams on the south side of Walmart's property. "The levelers will maintain the height of the ponds at a safe, desired level, without disturbing the beavers and their efforts," Bouwes says. "It's a winning solution for Walmart, the beavers and the surrounding community." 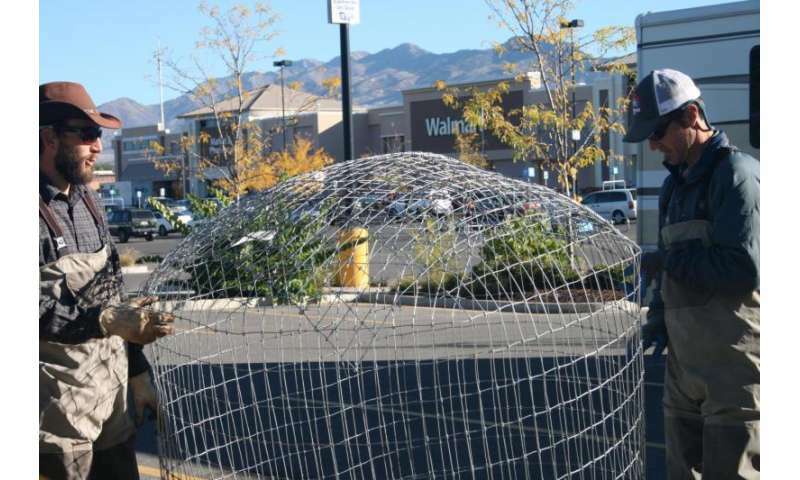 "We appreciate the work of the Utah State University Quinney College of Natural Resources and the Utah Conservation Corps in addressing recurring concerns regarding beaver activity in the creek beside the south Logan Walmart, " wrote Delia Garcia, Walmart director of communications in a Oct. 12 statement. "Their expertise in the area of riparian habitat preservation and humane beaver deterrence has led to the implementation of a long-term strategy that addresses the potentially destructive impacts of unmanaged beaver dams while preserving the riparian habitat and cultivating a rich environment for the creek's natural inhabitants." Congratulations! More areas should work to preserve beaver habitat which will protect fish, frogs and waterfowl. Not to mention recharge the aquifers we all depend on. Installing a pond leveler is a good investment. My city did 8 years ago to control flooding. And now because of our SAFE beaver-tended wetlands we regularly see otter, steelhead, woodduck and even mink in our urban stream. .Utah has a beaver deep bench when it comes to folks who know how and why to coexist with beavers.